The first time I went to the Italian Film Festival was in 2008 and I asked Karen to come see with me Giorno E Nuvole – Days and Clouds (2007). In the heady first weeks of dating Karen and I did not care for the film and did not care that we did not care for it. Just another date that’s real purpose was for us to be together. Centred around a well off middle aged couple declining to harder living conditions as the employment of the well establish husband is radically altered. Depressing and heartbreaking and all too real in the aftermath of the Global Financial Crisis. One thing that still remains with me years later is the power of the lead actress Margherita Buy. 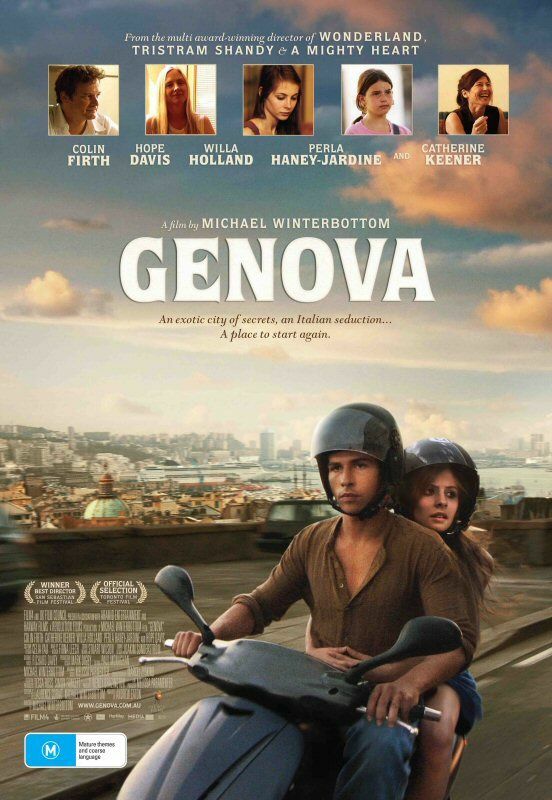 In 2009 we decided to play it safer and went with Michael Winterbottom’s Genova starring Colin Firth as the father of two daughters and a widow who moves to Italy as an academic to provide a seachange. Well intentioned, with beautiful scenery and thoughtfulness it still proved for the most part unengaging to us. Not trusting our own judgement we deferred to our friends in 2011 who had made good selections in the past for the French Film Festival and went to see Habemus Papum – We Have A Pope. Coming off a 10 minute standing ovation at the Cannes Film Festival that moved director Nanni Moretti to tears something must have been lost in translation because I laughed nor cried but I did fall asleep on the lazy sunday afternoon screening we went to. This is no reflection on the film festival itself, if you look at the programs for the years we went you will see universally acknowledged modern classics and crowd pleasers. It seems we just had a bad run of luck or made poor decisions for own tastes. Following the wonderful opportunity to interview Palace CEO Benjamin Zeccola last year for Scenestr magazine about the 2017 Italian Film Festival, I thought for sure I would take him up on one of his recommendations and see maybe a comedy like War for Love but alas circumstances kept us from the film festival last year too. This year the opportunity to attend opening night for Scenestr magazine came up and having had such a wonderful last year at the Brisbane opening night for the Cine Latino Film Festival I couldn’t wait to take Karen with me this time. The film was Loro, directed by Paolo Sorrentino who made easily one of my favourite films of 2015 Youth along with the fantastic This Must Be The Place (2011) and The Great Beauty (2013), the latter I watched in anticipation of seeing Loro. Loro is easily the best film Karen and I have seen at the Italian Film Festival and an interesting film that holds your attention for the most part. It re-teams Sorrentino with Toni Servillo who gives a fantastic performance as the magnetic Italian Prime Minister Silvio Berlusconi. The opening half an hour becomes tedious despite its fireworks visuals and editing as it focusses on another character but when Servillo arrives the film grips. Upon reflection thought it comes across as some great ideas but lacking in overall vision. I suspect this is intended but I can’t say that excuses the lack of discipline. You can read more of my thoughts here http://scenestr.com.au/movies-and-tv/loro-italian-film-festival-brisbane-opening-night-review-20180921 but I cannot deny that the film lingers and Sorrentino remains one of my favourite directors to watch. Before the movie in foyer of Palace Barracks. Copyright Lloyd Marken. With my Italian silk tie from my sister. Copyright Lloyd Marken. A view of the crowd. Copyright Lloyd Marken. Lavazza Italian Film Festival. Copyright Lloyd Marken. Palace Barracks Cinemas. Copyright Lloyd Marken. As for opening night itself, Karen and I had a wonderful time. There was a cheese table that had many a party goer hovering nearby, a live band, much wine and tasty h’orduvres making the rounds as the 2018 Lavazza Italian Film Festival kicked off in style. Grabbing our goodies bag though Karen and I eventually had to make our way home for me to start on my review. Our luck at the Italian Film Festival is definitely improving and there are plenty of wonderful films to check out this year yet. Produced by Eyeball Media Enterprises, Scenestr is an online national magazine with local offices around Australia. Celebrating 25 years in 2018 of publishing history they’ve excelled at moving into the digital realm but they remain at heart from the streets. They still publish magazines in print for WA, SA, NSW, Vic and QLD every month. If you’re into music they’re a great read but they do cover all of the arts including festivals, stand-up comics, fashion, theatre and film. I feel very fortunate to get to write for them. Produced by Eyeball Media Enterprises, Scenestr is an online national magazine with local offices around Australia. Celebrating 25 years in 2018 of publishing history they’ve excelled at moving into the digital realm but they remain at heart from the streets. They still publish magazines in print for WA, SA, NSW, Vic and QLD every month. This interview was published in print in the September issue for New South Wales issue which is always a thrill for a GenX guy like myself. A digital copy of that issue can be viewed here http://scenestr.com.au/read/NSW/2018/28-NSW/scenestr-NSW-28.html#p=37 If you’re into music they’re a great read but they do cover all of the arts including festivals, stand-up comics, fashion, theatre and film. I feel very fortunate to get to write for them. As previously mentioned I did a work elective in my final undergrad year at QUT where I was part of a group of students who wrote the newspaper for the Brisbane Writers Festival in 2004. Until the past couple of years it was one of the proudest moments of my short aspirations of being a writer and it still remains important to me. It may be coincidence but I suspect not that I never really went back to the writers festival in subsequent years until the call went out from Scenestr for interest in reviewing events at this year’s BWF. I consider myself very lucky as a result to have been able to attend the Dinner with Laura Weisberger at Gerard’s Bistro. I was in attendance by myself and so was pleased when I saw an old friend Karen B arrive. As you maybe aware Karen set me up with my wife Karen. We stood and chatted while delicious entrees were served on trays around us and bubbly was sipped. Karen had a far greater knowledge of not only Weisberger and her work than I did but it turned out the Brisbane Writers Festival was a big deal for her and something she regularly attended much like the Brisbane International Film Festival is important to me. As we made our way indoors for the main event we were directed to allocated seating but I was lucky enough that my friend was only two people away at the next table. I was not sure of the format and wondered if I was at a press table and was expected to ask questions of the famous author on behalf of my publication. As I sat waiting, the current news anchor for Channel 10 in my home state, Georgina Lewis introduced herself and her friend Elissa to me as they sat down opposite. Another beautiful woman wearing a star necklace and long blonde hair said hello to me by name as if we were old friends. This was Mary Dickinson who amongst other things runs her own blog site and regularly contributes to various publications including Style Magazine. That was enough for me, I dashed over to the gentleman who had directed me to my table and asked if he could confirm the format of the evening. He mentioned what I was most familiar with, there would be an interview followed by questions open to the audience but I would not be called upon as a reviewer to say anything which is what I had been expecting would be the case but had wanted to confirm given the wattage at my table. Perhaps sensing a little nervousness he assured me “Don’t worry you’ll be sitting next to Johnny the owner who is very approachable.”. Terrific. The thing though was that this was quite true. The evening began with Marie-Louise Theile who used to be the Channel 10 news anchor and now runs her own company interviewing Lauren Weisberger in front of the bar while we all listened. Those attending had shelled out $165 a ticket for a three course meal at one of Brisbane’s trendiest restaurants with the author. Weisberger in town to promote her new book When Life Gives You Lululemons did not disappoint. You can read my review here http://scenestr.com.au/arts/dinner-with-lauren-weisberger-review-brisbane-writers-festival-20180907 of the dinner but suffice to say it was fun. 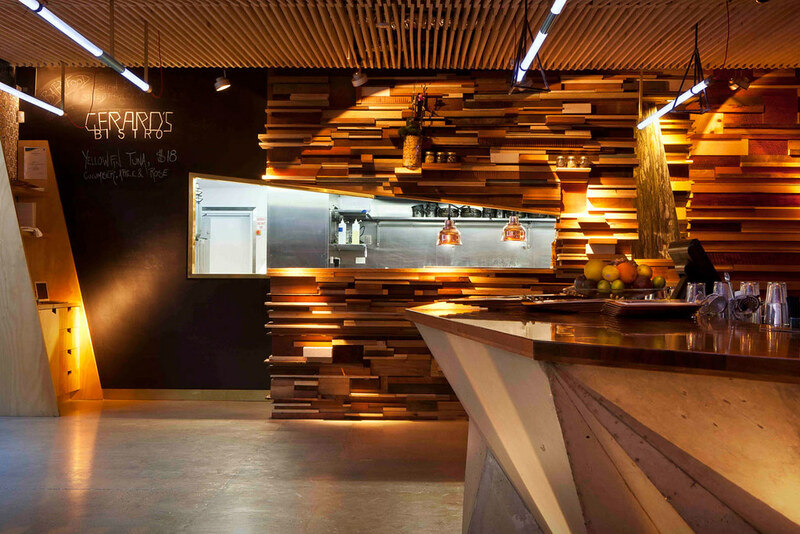 I found the décor of the fashionable James Street eatery appropriate to the event with a panelled wall of various wood evocative of books on a shelf and intimate reading areas you find in grand old libraries. Afterwards I kept my mouth shut I hope for the most part and just quietly listened during dinner and took my notes for future reference when writing the review later. However there were little moments when me and my fellow diners talked a little about ourselves, I remember talking about my marriage and my interview with Ali McGregor. Mostly I listened and talked to Karen at one point but appreciated the generosity and friendliness of my fellow diners who walk in different circles to me but were treating me no differently. I even got an old fashioned out of the mix which hit the spot nicely. The meal was super impressive including possibly the best pork I’ve ever had. I went to buy a copy of Lululemons and get it signed by Lauren who kindly did and posed for a picture. While everybody else was eating she was taking one table of guests at a time and doing this. Karen left and I took my queue to follow, after all as I had a review to write and a day job to get to in the morning. I gave my leave to everyone at the special table I had gotten to sit at and stole off into the night with some pretty cool memories and a brand new book. Lauren Weisberger, the Brisbane Writers Festival and Scenestr have kindly provided me once again with another highlight I am grateful for. Late last year I was able to interview comedian Randy Feltface who regularly collaborates with Sammy J and now I have been able to speak to Sammy J as well for Scenestr magazine. It was an utter joy speaking with Sammy J who was very encouraging and friendly. After the interview was over my entire mood had lifted, I think this is part of his appeal with audiences – Sammy brings joy. A Melbourne lad he was on hand to promote his new show at the Melbourne Fringe Festival, The Fifty Year Show Part III which is run every five years having started in 2008. Deceptively ambitious I was fascinated by the concept of the show which recaps current events and trends while also bringing back elements of previous shows. This will allow it to cover fashion, news and so forth but also more poignantly life itself and in a particular way the careers of all those involved. It’s interesting to think of a 75 year old Sammy J mounting the last edition and what kind of a performer he will be at that point. Getting a young fit man to strip down to his undies in the show will play differently as time goes on and yet probably get as many cheers in the last show as in the first if that person is still agreeing to it. Because we age and we evolve and already Sammy is acknowledging that, as he moves to include more female performers this year. You can read my interview here http://scenestr.com.au/comedy/sammy-j-continues-his-50-year-show-at-melbourne-fringe-20180911 nd if you’re a Melbourne reader I suggest you take the opportunity to go and see the show for yourself. Produced by Eyeball Media Enterprises, Scenestr is an online national magazine with local offices around Australia. Celebrating 25 years in 2018 of publishing history they’ve excelled at moving into the digital realm but they remain at heart from the streets. They still publish magazines in print for Perth, Adelaide, Sydney and Brisbane every month. For the month of September they returned to the Melbourne market with the debut print edition of Scenestr in that city! It is a thrill to have had a shortened version of my interview with Sammy J feature in that first issue on page 38 which can be seen digitally here http://scenestr.com.au/read/VIC/2018/01-VIC/scenestr-VIC-01.html#p=39 If you’re into music they’re a great read but they do cover all of the arts including festivals, stand-up comics, fashion, theatre and film. I feel very fortunate to get to write for them.